Landstrider Puppet Head [DCLSH] - $0.00 : Hollywood History Online, Discover the Magic and Bring Hollywood Home! 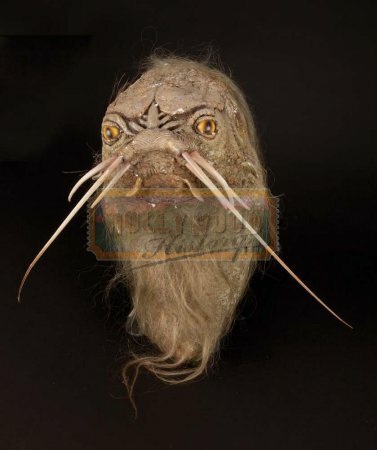 This is the head from the Landstrider creature, the long-legged quadruped ridden by Kira and Jen in The Dark Crystal. Constructed of fiberglass underskull, foam latex, entirely hand-painted and detailed, with hand-punched hair, hand-painted and clear coated eyes. Internal wire support an canvas-covered interior for the actor's comfort. Measures 17 in. tall x 12 in. deep. Exhibits minor cracking and wear; otherwise, remarkable condition. The head has been expertly restored and preserved by Tom Spina.